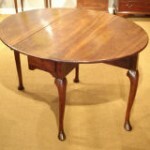 This lovely 18th century mahogany drop leaf dining table that has just come into the showroom is exceptional in design and quality. The drop leaf style of table developed from the more cumbersome gateleg dining table during the second quarter of the 18th century. 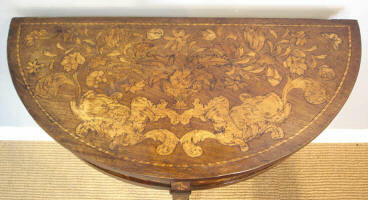 This example dates from about 1740 and is made from Cuban mahogany, the very dense, fine quality mahogany used in the early 18th century, and sometimes erroneously described as “red walnut”. It has a wonderful, silky patina. What marks this table out as unusual is the beautifully executed cabriole leg, and the hoof foot, which includes a carved fetlock behind. This type of foot is not often seen on English furniture, although the design is an extremely ancient one, going back to Egyptian and Roman furniture. It is also known as ‘Pied-de-biche’, a French term meaning deer’s foot. Being only 46” by 38”, and with the choice of having either one or both flaps up, this makes a lovely centre table, or an ideal dining table for a small house. Amongst new stock this week is this lovely pair of walnut, cabriole leg sofas. As with all antique furniture, pairs are particularly hard to find, and hold intrinsically more than double the value of a single item. These date from about 1880, and are typical of that period in various ways; the Victorians particularly admired the work of the 18th century cabinet makers, and based many of their designs on them. These settees echo pieces from the Queen Anne period [1702 – 1714] in the use of walnut, which was the main cabinet timber of the day, and the shaped, or ‘cabriole’ legs. This is a French term meaning ‘bound’ or ‘leap’; the shape was adapted from an animal leg and was popular throughout the 18th century. These sofas are typical of the period in which they were made, in that they are beautifully and strongly constructed, with sturdy beech rails under the upholstery. They are in lovely condition throughout, and we are offering them for sale as they are, so that you can choose your own fabric. 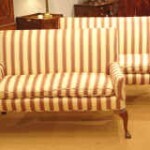 The price includes the cost of reupholstery by our master upholsterer Louis, but excludes the cost of the fabric. Contact us to find out how much fabric you need; we have a good selection here at the showroom if you need help choosing.